STMicroelectronics and TomTom have announced a package of development tools in the STM32 Open Development Environment that connect directly to TomTom Maps APIs (Application Programming Interfaces) for location, tracking, and mapping data services, accelerating product development and reducing time-to-market and development costs for developers. “We have combined TomTom’s industry-leading location-based and mapmaking technologies with ST’s unrivaled combination of silicon and system expertise to create a unique offering that provides easy access to TomTom’s Maps APIs to empower developers to create groundbreaking, location-aware applications faster and more efficiently,” said Anders Truelsen, Managing Director of TomTom’s Enterprise Business Unit. 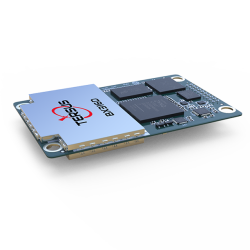 In addition to the STM32 family of Arm Cortex-M core microcontrollers, the development tools leverage ST’s market-proven multi-constellation Teseo positioning-receiver technology to perform all positioning operations including tracking, acquisition, navigation, and data output, according to the companies.